The Bachelor of Fine Arts program and the Visual Art and Aboriginal Art streams in the Bachelor of Creative Arts are located at several sites on and off campus. An emphasis on community partnerships has resulted in the sharing of spaces and other resources. The Ceramics studios, the Aboriginal Art studio, and Printmaking studio are the primary areas in this floor. The 6000 square ft. Ceramic studios include two classrooms equipped with worktables, shelvigns and AV; a moldmaking and slip casting room; dry material storage room; glaze room and kiln rooms; and a studio for thesis students. Studio facility includes 15 Shimpo and Brent pottery wheels, Bailey 30″ Drive Board slab roller, two extruders, Shimpo pug mill, Soldner Professional clay mixer, sandblaster, 6 Skutt electric kilns, a portable raku kiln, and a Bailey gas kiln. Two other classrooms on this floor are utilized for visual design and art history courses. Students who are physically challenged have access to an elevator located inside the library. Jeff Humphrey Centre is a two story brick building located at the southwest corner of campus alongside Victoria Avenue. It is located behind the gym and adjacent to the Kinsmen Park. Entry to the building is normally from the north side facing the parking lot. it currently houses the painting and drawing studios of the Department of Visual and Aboriginal Art. 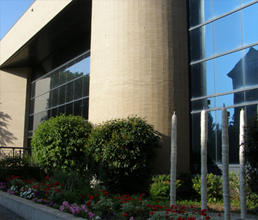 The west half of the building houses a student gallery, the Glen P. Sutherland Gallery of Art. The Glen P. Sutherland Gallery of Art is located on the southwest corner of the campus. This gallery serves students, faculty and visiting artists, as well as BFA thesis exhibitions of graduating students. The Assiniboine Community College (ACC) is located at 1430 Victoria Avenue East in Brandon. It is a fifteen minute drive from the BU campus. Public transportation is available. Brandon University and ACC have a partnership to offer a major in Digital Media and Design. Students completing the two year Web Design Diploma offered at ACC will be offered two years advance standing in the Visual and Aboriginal Art Studies Department at BU. Students may complete this diploma at the beginning or the end of their program. All web design courses are offered on the campus of Assiniboine Community College. There are five slots reserved in this program for BU students wishing to complete their BFA degree. Registration for the ACC program is separate from BU registration.